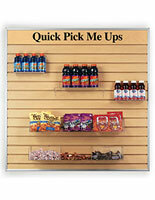 Looking for an effective way to present retail merchandise? 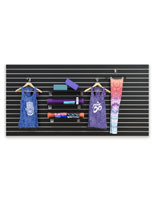 Slatwall panels serve as a blank canvas for creating effective store displays. 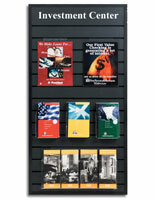 Oversized wall-mounted slot boards help you sell your product, promote a cause, or disperse information. 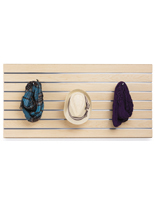 Available in a variety of styles including weathered barn-board, cube subway tile, brick, and rugged OSB — slatwall panels are designed to work with specially made accessories. 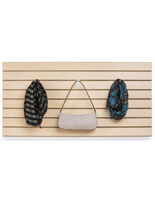 Simply slide hooks, brackets, shelves, sign holders, and other compatible attachments into the pane's groove to start showing your merchandise. 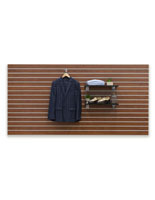 These versatile slatwall panels allow for on-the-fly swaps as inventory grows and changes. 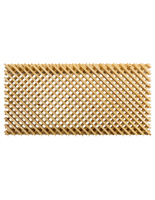 Embellish your wall with retail designer grooved panes, and set yourself apart from the competition by improving the shopping process for your valued customers. 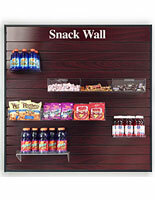 Why choose horizontal grooves to display merchandise? 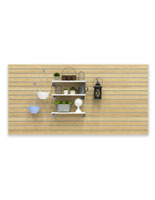 Durability: Slatwall panels are constructed with solid MDF and rugged laminate for dependability. They mount to the wall via four provided large screws and anchors. Screw caps are also included to protect the appearance of your presentation. Customizability: Some models offer the option of customizing the unit with your company name or logo. 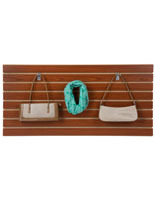 The ample styles and accessories also available help users make the display their own. 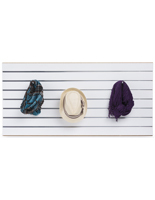 In addition to the stylish pre-designed decorative finishes, we also offer durable white paintable slotted boards that DIY fans can use to create one-of-a-kind presentations. Affordability: Compared to other retail displays, slotwall panes are priced modestly and offers the user more freedom to add creativity to the presentation. 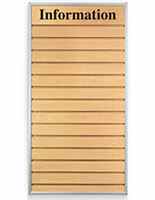 Versatility: Each board can be mounted alone or used as building blocks to cover an entire wall. Once installed, all that’s left is adding accessories and inserts. The beauty of these displays is that presenting anything from candy to high priced clothing effectively is possible. Usability: The groove paned modules require no tools for assemble. 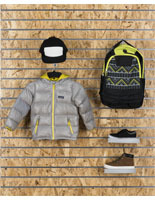 Once the pieces are combined all you need is your merchandise and the accessories! 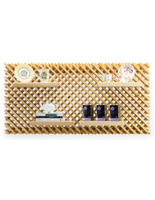 How should you hang merchandise with these slotwall modules? 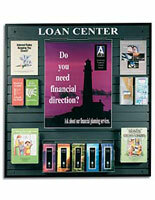 Acrylic brochure and sign holder accessories attach to the slots of each pane, allowing the user to showcase advertisements and notices with ease. 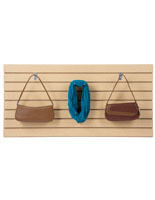 Add face-out hooks or hang rails to present clothing or other types of merchandise. 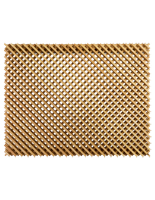 For products that weigh more than others, add "Readysert" inserts to your pane's channels. These reinforce the slotwall, making them stronger to hold more merchandise. 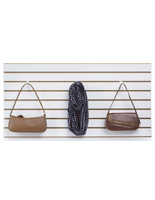 Purses and handbags can be hung by their straps and look trendy in front of panels with a decorative finish — hats and jackets are also hung the same way. Additionally, hooks can be used to hang electronics, cables, toys or any other merchandise that comes in a polyethylene package with a cutout hole. If you're a gas station or convenience store, try using horizontal grooves and hang rails to hang bags of chips, nuts and other snacks. The addition of accessories is what makes these modules so appealing and fun to users. 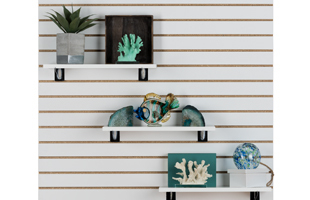 Make sure to check out our entire selection of grooved walls, kiosks, and accessories to make displaying products of all kinds not only possible but very simple. 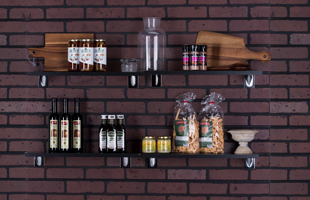 Read up on more information regarding best practices and types of slatwall to find which type is perfect for you and your retail store!